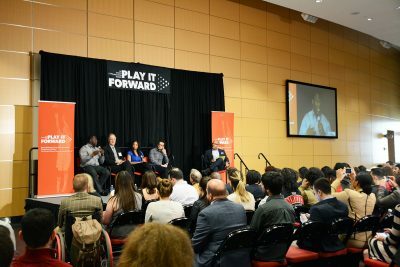 Last Friday, the second Play It Forward Summit brought industry leaders to Boston University’s Agganis Arena to tackle race and gender issues in the sports industry. Speakers and attendees explored the two heavy-hitting topics with candor at the event, organized by BU’s College of Communication, BU’s Athletics Department, WBUR and the Howard Thurman Center for Common Ground. Using a multimedia approach and speaker meet and greets, the summit encouraged a new approach to engagement. “Diversity isn’t just going to knock on your door, you have to go look for it,” said Jemele Hill, co-host of ESPN’s “SportsCenter” at 6 p.m., during her panel. Her message manifested itself throughout the summit’s various panels, focusing on the importance of action to create progress for underrepresented populations in sports and sports journalism. The morning began with the panel “Breakfast with Champions,” where New England Patriots defensive back Devin McCourty, joined by former Celtics forward and 2008 NBA Champion Brian Scalabrine, current Boston Red Sox President of Baseball Operations Dave Dombrowski, and former Bruins forward and current Bruins Foundation Executive Director Bob Sweeney, spoke with the summit’s host, HBO and NFL Network’s Andrea Kremer, who is also a BU lecturer. With 36 championships between the four represented teams, the discussion focused on the speaker’s takes on how they have both witnessed and experienced race and gender inequalities. “Sports is a microcosm of society,” McCourty said during the panel, calling to attention the irrefutable intersection between society and the sports realm. Kremer called to attention one instance of athletes speaking out on their own views, specifically mentioning Colin Kaepernick’s decision to kneel during the national anthem. “You’re given a platform once you play a sport,” replied McCourty, denoting the heightened attention athletes receive. McCourty gained attention after announcing that he will not attend the team’s visit to the White House following their Super Bowl victory, citing his daughter as the reason behind the decision. He did not want his daughter to question why he shook hands with a president that holds beliefs that don’t align with his own. Kremer also brought to light the obvious lack of women in leadership roles in male professional leagues in addition to unequal pay and public respect for female athletes. The next panel focused on the future of race in sports and brought insights from Hill, director and producer of “O.J. : Made in America” Ezra Edelman, former Baltimore Ravens coach Brian Billick and NFL veteran and founder/CEO of Windpact Shawn Springs and was moderated by ESPN senior vice president and editor-in-chief of “The Undefeated,” Kevin Merida. Hill, an African American female sports journalist, represented a rare instance in the world of sports journalism. “I sort of chuckle at this idea that sports writing, sports journalism has become a liberal profession — have you seen the statistics?” she said, citing the necessity of diversity to cover certain societal complexities with varied views. Topics ranged from Kaepernick, hindered access for minorities to athletic opportunities, and how race played into cases such as O.J. Simpson’s murder trial. The final panel of the series concentrated on the staggering gender gap in professional sports. Speakers ignited discussion over hot topics such as the U.S. women’s national hockey team’s boycott and later victory at the International Ice Hockey Federation World Championship, reactions to domestic abuse and the pay discrepancies between genders. The panel moderated by Kremer consisted of 670 The Score anchor and Sports Illustrated’s Julie DiCaro, WBUR and NPR’s Shira Springer, 12-time Olympic medalist Dara Torres and former ESPN contributor Annie Apple. Throughout her extensive work in the field, Springer noticed a startling trend in coverage on women’s sports. “[Controversies] are when women’s sports get attention,” Springer said. DiCaro, a recipient of verbal attacks over social media, highlighted the importance of males with power to take action themselves to correct the issue. The final segment of the summit featured a discussion between Kremer and HBO’s Bill Simmons, a BU alum who runs his own website, The Ringer, on the future of sports journalism. His keynote touched upon the importance of youthful perspectives, his own career experience and the importance of a multimedia approach. 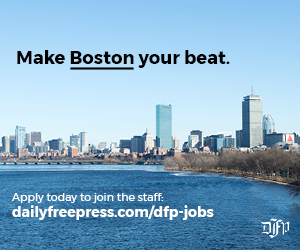 “I see the future as niche sites adding up to a larger whole,” said Simmons. After he spoke, Merida sat down for an interview with The Daily Free Press, explaining the purpose of the event as a call to action. “Women and journalists of color get tired of having to carry the freight of this discussion and this conversation all of their lives,” he said.